For Models:For All Bloody Mice Except Q-series. Offers unique 4-core system. It incorporates 4 various levels for all game requirements: "Low, High, Ultra, and Extreme. 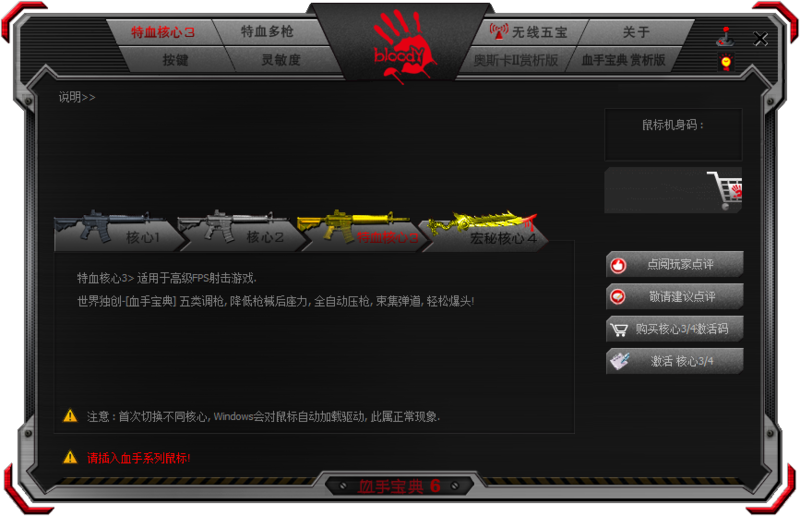 "Suitable for MMORPG, FPS and all genre of games. Upgrade Tip: For those activated "Bloody 2/3/4/5" versions, user is free to upgrade Bloody to the latest version eternally. Innovative multi-cores technology features full function keyboard programming; one key to perform "Single Combo" in MMO/RPG/FPS games and save tremendous gaming cost. Bloody's innovative, unique 7.1 gaming headset with sound-to-location recognition technology offers [Smart 360 Gaming], [2.0 Audio-Enhanced Multimedia], [7.1. Surround Sound] - three functions within one module. Provides excellent sense of coverage, superb live experience, and precise sound-to-location recognition technology. In the intense gameplay, millisecond often determines the winner. You may not know how long it will take the computer receives the data after pressing the key of your mouse or keyboard. This time delay is commonly known as "Key response". This software is particularly made for the gamers. Through the simple PK face, gamers may explore the truth of the real key response of the gaming mouse and keyboard. Besides, gamers also may get full understanding of the key design difference from the dartboard explaination so as to avoid spending lots of money but obtaining the low response inferior products. BloodyIllumine Software is the RGB editor that allows for personalized creative lighting effects with 16.8M colors.